Ten years ago this August, our country was shaken by Hurricane Katrina, a storm that affected millions along the Gulf Coast and in regions across the country that rose to their aid. In record numbers residents of the affected communities, national service, businesses, nonprofit organizations, churches, and volunteers worked together to rebuild communities. The Gulf Coast has come a long way since August 2005. This summer we commemorate 10 years of hard work, community resilience, and the service and innovation that continues to support an even stronger and healthier Gulf Coast. The house on Rampart St had been sitting blighted in the Historic Holy Cross neighborhood in the Ninth Ward since the storm when it was donated in 2010 to Project Homecoming by the family members to whom the house was left to. With the help of AmeriCorps members and volunteers, Project Homecoming was able to completely renovate the property for a single mother and her teenage daughter to purchase as a first time homeowner. This home was badly damaged by Hurricane Katrina. But with the help of the AmeriCorps grantee organization, Project Homecoming, this home was fully renovated as part of a larger historic renovation project in the Historic Holy Cross neighborhood in the Lower Ninth Ward of New Orleans, LA. A National Service volunteer is seen here cleaning up the inside of a home in St. Bernard Parish through a piece of broken glass that is eerily shaped like that of a hurricane. AmeriCorps members and volunteers help the community rebuild in St. Bernard Parish, LA, on the first anniversary of the Hurricane Katrina recovery in 2006. AmeriCorps members in Pass Christian, MS, help the community rebuild on the first anniversary of the Hurricane Katrina recovery in 2006. In late 2005, Harry Connick, Jr. and Branford Marsalis came to New Orleans Habitat with an idea. Along with NOAHH executive director Jim Pate, they created the concept of Musicians' Village, a neighborhood designed to preserve the musical heritage of New Orleans, past, present, and future. NCCC members are seen here beginning to prep the site of a future home in Musician’s Village in March 2006. New Orleans Area Habitat for Humanity AmeriCorps member, Audrey Fish, presents one of the home dedication gifts to the family. The home was dedicated in October 2014. Sign up for updates and how you can support the on-going effort. AJ Lyman signed up to join the AmeriCorps St. Louis Emergency Response Team in the spring of 2005. The very day he had moved to St. Louis was the day Hurricane Katrina made landfall. 48 hours later, he was in Mississippi taking his first steps in a new world of emergency response. Lyman had just graduated from Wabash College with a degree in Religion and plans to eventually teach religion after his one year term of service with AmeriCorps. “My grandfather was very service-oriented, and he raised me with a spirit of service,” said Lyman. That spirit came out immediately upon his arrival at the worksites. Lyman and his team worked on a wide assortment of tasks, including sorting unsolicited donations, managing a point of distribution, mucking houses, managing volunteers, and helping to manage a temporary village for impacted residents. He went on to establish great, lasting relationships with many of the people he worked with, saying they were the most amazing part of his time serving. Lyman met his wife during a term of service, and made a best friend that went on to be his Best Man and the godfather to his daughter. Within a few weeks of his time in Mississippi, Lyman knew he would be doing another year with Emergency Response Team, and that he had found a calling. He currently works as an Emergency Management Specialist for the Department of the Interior US Bureau of Reclamation. Margie Legowski and Jennifer Feltner initially got involved in relief for Hurricane Katrina through Holy Trinity Catholic Church in Washington, D.C., which partnered with St. Rose de Lima Catholic Church in Bay St. Louis, Mississippi after the storm. Holy Trinity made a three year commitment to St. Rose in 2005 to help them with their efforts in Bay St. Louis, as well as send volunteers of their own. Legowski took an early retirement to continue to serve, and has been spending a lot of time doing so in El Salvador. Feltner is a Wildlife Biology PhD student at North Carolina State University, and is planning a trip down to Bay St. Louis for the 10th Anniversary of Hurricane Katrina. Jack Styczynski joined AmeriCorps VISTA 8 years after Hurricane Katrina hit as part of his promise not to forget the rebuilding of New Orleans until the job was done. Styczynski had visited New Orleans for work shortly before the storm and tried to get back into the city in the days afterward, only to find that wasn’t possible. Helping with the relief effort in Gulfport, Mississippi instead, he vowed to come back to New Orleans as soon as he could, and spent most of his vacation time over the next 8 years volunteering with various rebuilding organizations in the city. During that period, he worked alongside many AmeriCorps members and ultimately decided to leave his career in New York as a news researcher and become a VISTA himself at Youth Rebuilding New Orleans, where he is currently serving in his second term as a volunteer coordinator and grant writer. Having a hand in raising approximately half a million dollars for the organization, Styczynski is proud to have helped teachers buy affordable rehabilitated homes and local youth pursue their education while learning construction skills as YRNO employees. Alex Curley served as an AmeriCorps member in 2000-01, and joined AmeriCorps NCCC as a team leader in 2005. Curley had just graduated college and thought the experience would be good for her professional development. Then, one week into her term of service, Hurricane Katrina hit, which left her and her team focused on the Gulf Coast. “While we were watching the events unfold on the news, everyone was glad that we were there to help initially,” said Curley. Curley’s team facilitated many projects for the St. Bernard Parish Department of Recovery. Among these, the team facilitated the gutting of 734 homes, built and maintained a base camp, coordinated over 95,500 hours of volunteer service, trained 344 team leaders from other organizations, and facilitated the removal of 367,000,000 pounds of debris. Curley went on to work at the Corporation for National and Community Service Headquarters, and deployed to act as a liaison between FEMA and NCCC teams when Hurricane Ike hit. She currently is an Operations Management Specialist for the Special Inspector General of the Troubled Asset Relief Program and is working for her Master’s in Emergency and Disaster Management from Georgetown University, where she was the first Georgetown student to receive funds from the Segal AmeriCorps Education Award Program. Duncan Cheney joined AmeriCorps through the Louisiana Delta Service Corps in 2009 after a week long service trip with his church to the Gulf Coast after Hurricane Katrina during his college years. Cheney wasn’t sure what he wanted to study or do after graduation, and decided to head back to Louisiana after hearing about this opportunity for service. “Through service learning and early exposure, my service took me out of my comfortable, stable environment and exposed me to all kinds of different things,” said Cheney, who served as a worksite manager during his year of service with Project Homecoming. This entailed acting as volunteers’ liaison, teaching them construction skills, and getting them the materials they needed. Kellie Bentz joined AmeriCorps in 2004 after graduating from the College of Charleston. As a recent graduate, Bentz was unsure of what direction she wanted to be going in, and her desire to serve helped her choose AmeriCorps as her next step. Bentz served as an AmeriCorps Team Lead in Atlanta, Georgia where she was inspired by many of her experiences. “The second grader I had been tutoring for an entire year could finally write his ABCs,” Bentz shared. “It made me realize how grateful I was for having this little boy in my life to show me what a privilege it was to be able to read and write, and to never take that for granted.” It was moments like these that made Bentz wish to continue her path of service. Bentz then went on to be a project sponsor for AmeriCorps NCCC teams in New Orleans, where she made lifelong friends and had, what she considers, the most formative experience of her life. She was involved with building, managing, and directing what became HandsOn New Orleans. HONO helps provide service opportunities to those in search of service, including out-of-state individuals, local residents, corporate teams, and tourists. Since March 2006, HONO has saved the community of New Orleans an estimated $13 million. They’ve engaged over 35,000 volunteers for more than 600,000 completed hours of service. Bentz served as the Executive Director for HONO until 2010, and is currently with Airbnb working with Global Disaster Relief. When Rachel Schumacher was 16 years old, Hurricane Katrina tore a hole through one of the most important places in her life. Her grandparents had retired to Ocean Springs, Mississippi decades before, where her family would visit every year for Christmas and sometimes during the summer. Schumacher’s grandmother had become ill and was admitted to a hospital days before Katrina hit. She and her husband survived, but when all was said and done, all they had left was what they had packed for the hospital and a few trinkets, like old Mardi Gras beads, that they were able to salvage from the wreckage of their home. “When we learned the news it felt like my whole childhood had caved in, wiped away in the blink of an eye by a 30 foot storm surge and just disappeared,” said Schumacher, who says the trinkets they were able to save serve as broken reminders of what used to be. While she was attending Wheelock College in 2009, Schumacher’s strong connection to the Gulf Coast drew her to the service learning trips being offered to rebuild homes in New Orleans with the St. Bernard Project. Schumacher participated in three of these trips over the course of three years at school, where she discovered her love for service. Jon Skvarka, one of the first AmeriCorps members to serve with Rebuilding Together New Orleans, now serves as its Director and has made New Orleans his home. Skvarka initially came to New Orleans as part of an Alternative Spring Break program through Dickinson College, and the experiences he had inspired him to come back and stay even longer. As an AmeriCorps VISTA the following year, Skvarka’s duties as an information officer included writing grants, working with neighborhood leaders to write homeowner biographies and neighborhood history, writing in house publications, and working to find resources for low income homeowners who needed repairs. Skvarka described his work as “behind the scenes,” but that’s how he liked it. In 2008, Rebuilding Together hosted the first ever NBA All-Star Day of Service. That year the NBA All-Star Game was hosted in New Orleans, the first big event of its kind to be hosted since Katrina hit in 2005. NBA players and hundreds of other volunteers worked on the total renovation of two houses that day. Crystal Utley returned to her home state of Mississippi as an AmeriCorps Attorney after Hurricane Katrina to put her legal skills to work. She served with Equal Justice Works in 2006 and 2007 with the Mississippi Center for Justice in Biloxi, MS. While with Equal Justice Works, Utley managed Hurricane Katrina legal aid and pro bono for the state of Mississippi, including volunteer recruitment and training, community outreach and legal clinics, as well as case management. Utley represented Katrina survivors with urgent disaster-related legal problems as well as representing housing nonprofits on the Mississippi Gulf Coast. “It was the best feeling when you knew someone was going to be evicted from their FEMA trailer that day, and we were able to stop it and help them from being homeless and they could stand there and thank us,” said Utley. After her AmeriCorps term, Utley stayed in Biloxi and continued working for the Mississippi Center for Justice where she recruited and managed over 200 national and local pro bono attorneys, in addition to over 100 law students, per year, to address Hurricane Katrina-related legal needs and other social justice issues, such as home repair fraud. Aaron Frumin’s involvement in service began after Hurricane Katrina hit when he called the Red Cross hotline to make a $25 donation. While on the phone, he realized that he wanted to do more, and by the end of the call the operator had signed him up for a shift the following day. A few months later in November of 2005, Frumin was deployed to New Orleans for three weeks to help with bulk distribution of food, water, buckets, bleach, and other essential items. Frumin learned about AmeriCorps NCCC during his time with the Red Cross, and decided to join after being impressed by the team members’ commitment and ability to come through for the city in such a tough time. In 2007, Frumin’s team was assigned to return to New Orleans, something that made him nervous after having been so involved in the relief effort. After AmeriCorps NCCC, Frumin took a job as a house leader with the New Orleans affiliate and Habitat for Humanity. After three years there, he went back to earn his degree from Tulane University, and then went on to teach with Teach for America for three years in Colorado. Frumin missed physical work, being outside, and working on collaborative projects, like the ones he worked on with AmeriCorps NCCC, and when thinking about the impact he wanted to make, he kept coming back to thoughts of New Orleans. Frumin returned to the Big Easy in September of 2014 to create unCommon Construction (uCC), a youth development program that builds character by building houses with currently enrolled high school students. The profits from the sale of the houses pay the apprentices through weekly stipends and cumulative scholarships. Frumin says he’s excited for the opportunity to put hammers to nails, and continue to gain momentum toward uCC’s vision of high school graduates with the skills and resources for the college or career path of their choice. Working for Habitat in the years after Katrina brought a lot of opportunities to be involved with challenging and rewarding worksite experiences, and serving with AmeriCorps has helped Frumin greatly, personally and professionally. Best friends Kenda Kuncaitis and Amy Choi served together as AmeriCorps NCCC team members in New Orleans immediately after Hurricane Katrina hit. Kuncaitis joined after college as a way to have some time to learn about herself while still being able to be of service, and Choi joined after being impressed by a print ad. The two were part of the next wave of people going down to the Gulf Coast after first responders. “We were showing these people they matter, their city matters, this matters,” said Kuncaitis. Hurricane Katrina was devastating to so many communities, but through serving, people with the passion to do something about it were able to rebuild the community and turn their sentiments into action. Kuncaitis will be heading back to New Orleans this summer, a city she calls “the most magical place on Earth,” and Choi said her and her husband’s next step in their road of service is figuring out a way to pass on their legacy of giving back on to their son. Over the past 10 years, CNCS has invested more than $333,055,500 in grant awards within Louisiana and Mississippi. As we move forward, CNCS will continue investing money in support of the organizations that help Gulf Coast citizens thrive. * The amount above represents an estimate based on historical data for dollars invested from AmeriCorps, Senior Corps, the Social Innovation Fund and other national service programs over the past 10 years. This number represents overall investment in the region that may or may not be related to recovery from Hurricane Katrina. Estimated number of AmeriCorps members and Senior Corps volunteers who have served in Louisiana and Mississippi including fiscal year 2005 through 2014 in response to Hurricane Katrina. The more than 39,169 members who served leveraged more than 648,251 volunteers for programs located in Louisiana and Mississippi including fiscal year 2005 through 2014 in response to Hurricane Katrina. Sign up for updates to support the on-going effort. We’ll send you periodic emails and keep you informed. Find AmeriCorps and Senior Corps opportunities that are suited to your particular skills, interests, and circumstances. Do you remember where you were when Hurricane Katrina made landfall? Send us your story today! Sign-up to be an Employer of National Service to recruit National Service alumni who've gained great skills. Find Volunteer Opportunities to serve in the Gulf Coast or in your own community. Looking for a way to give back? Donate now to any of our programs or disaster relief. The Corporation’s family of National Service programs played a pivotal part in ensuring that citizens could make a meaningful difference in restoring Gulf Coast communities. From our Senior Corps projects and AmeriCorps and VISTA members to NCCC teams and servicelearning projects with Learn and Serve America, our programs brought extraordinary passion, expertise, and above all talented and caring people to help in responding and healing. In Mississippi, Louisiana, Alabama, Florida, and Texas, the Corporation’s state office staff and the Governor-appointed State Service Commissions placed extraordinary energy and National Service resources into the recovery efforts. Often, the more than 35,000 participants in National Service programs who deployed to the Gulf in the past year coordinated, trained, and supervised the far larger numbers of community volunteers helping rebuild communities through organizations like Habitat for Humanity, YouthBuild, Hands On Network affiliates, and Points of Light Volunteer Centers. Often they planned and led the volunteer efforts to restore entire communities, like St. Bernard Parish, Pass Christian, and Waveland. And, across the region the National Service participants often worked shoulder to shoulder with both paid recovery teams and volunteers through organizations like the Red Cross, Catholic Charities, Salvation Army, and others. AmeriCorps Alum and Marine Veteran, Reese May, recounts his service as an AmeriCorps member in New Orleans and the importance of national service. 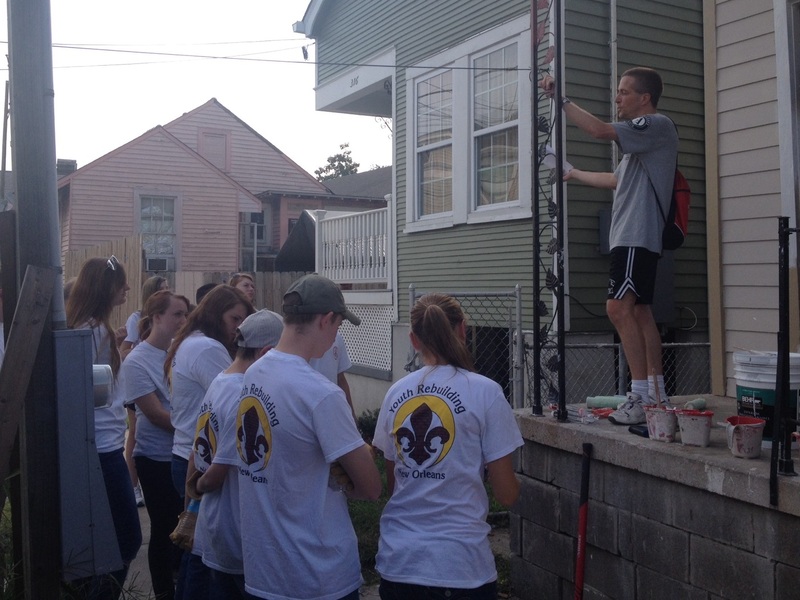 Reese served with St. Bernard Project in 2011 supporting disaster-impacted residents and families in the New Orleans area. On August 29,2005, I was in Al Qa'im, a small Iraqi town on the Syrian border. I had three weeks left on my first deployment to Iraq and I could hardly wait to get home to my family. As my unit (an Anti-Terrorism Marine reserve unit comprised entirely of Mississippi and Louisiana residents) prepared for one of our final operations, we saw limited coverage of the storm's approach on a chow hall TV. It was increasingly unclear to what "home" we might return. The rest of the story you already know. The storm was devastating, the government response abhorrent, and even today, the recovery incomplete. 10 years later, more than 5,000 New Orleanians still lack the financial resources to return to their homes. The composition of many neighborhoods has changed and others have yet to return. But despite the storm's destruction, and the ongoing problems with disaster recovery in America -- New Orleans' story is hardly all doom and gloom. In the years since Katrina, New Orleans has given many the opportunity to become our very best selves. Habitat For Humanity kicked off the 10th year anniversary of Hurricane Katrina by building 10 homes in 10 days with its 2015 Build-A-Thon. WDSU channel 6 in New Orleans interviewed Peter Rumsey with Habitat for Humanity about the project. CNCS last week kicked off its yearlong collaboration with the ABC television program “Good Morning America" and the Salvation Army to help rebuild the town of Pass Christian, Miss., by removing 355 tons of debris from a residential street located less than a hundred yards from where Hurricane Katrina came on shore in late August. If you are planning a commemoration event, we'd like to hear from you! Please fill out our short form so we can support you and your organization. If you have questions about Katrina commemoration events or if you would like to get in touch with our press team for Katrina 10, please contact us today.